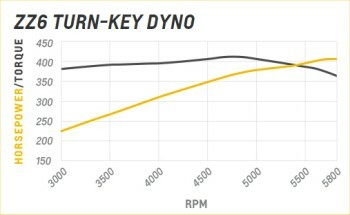 Chevrolet Performance’s all-new ZZ6 is one of the most powerful 350-based crate engines in the more than 25-year history of the ‘ZZ’ crate engine lineup. It uses aluminum Fast Burn cylinder heads equipped with LS-style beehive valve springs for greater high-rpm performance. It’s rated at 405 horsepower and 406 lb.-ft. of torque – more than any Small-Block engine ever offered in a production Chevrolet muscle car or Corvette! The ZZ6 is built with a cast-iron block with four-bolt mains, along with a forged steel crankshaft, an aggressive hydraulic roller camshaft and durable, high-silicon pistons. 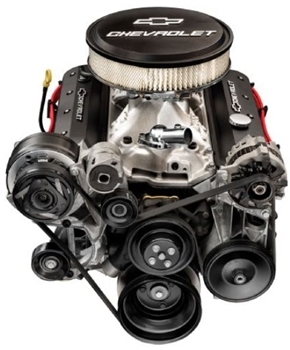 All-new, motorsports-inspired valve covers distinguish this new crate engine at a glance, too – along with Chevy "Bowtie" insignias in the ends of the cylinder heads that let everyone know you’ve got the latest Chevrolet Performance hardware under the hood.